Special Containment Procedures: SCP-1150-J is located in the backyard of the administrative bunkhouse in Area 22/13 (Bum███k, Russia), guarded by two (2) dogs due to lack of more suitable housing and severe staff shortage. Experiments with SCP-1150-J are suspended indefinitely due to absence of qualified researchers and lack of available test subjects; all Area 22/13 D-class personnel have been assigned to labour at Area 22/13 household plot in order to alleviate present food shortage. Proposal that SCP-1150-J be moved to another Foundation facility is pending indefinite review until suitable transportation and fuel arrives and access roads are repaired as necessary. MTF Phi-13, "Broke Blokes" is assigned to work with the local populace in order to conceal the existence of SCP-1150-J. on an ongoing strike due to not having received their salary for the last ██ months. This document will be registered in the Foundation database as soon as Area 22/13 electricity bill is paid and communication is restored; until then it is to be stored in Area Director ██████skiy's desk drawer along with other important documents. 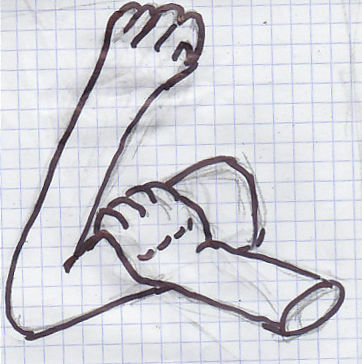 Description: SCP-1150-J is a sculpture made from low-quality concrete, depicting a disembodied human arm bent halfway with another hand gripping its biceps. The sculpture is approximately (last tape measure in Area 22/13 was lost during Incident ██.██.20██) 1.5 meters tall and can be carried by four (4) properly fed Foundation employees. The object's anomalous effect initially spread to supply agent ██████off and chief accountant █████va; both started having repeating nightmares in which SCP-1150-J is depicted as the arms and hands of a humanoid entity whose face and other distinctive features match ██████off's and █████va's immediate superior ██████skiy. Other Area 22/13 employees also reported having similar nightmares, particularly often the nights before paydays. Addendum: The object was initially found on the grounds of Area 22/13 storage area (abandoned due to absence of demand) by Saveliy Semyonovich, the Area warden, during a routine patrol (actually conducted for the first time in 20██ due to said warden's alcoholism). After SCP-1150-J was contained and the warden was questioned and severely reprimanded, he was issued two (2) bottles of 80 proof amnestic, with the side effect of partially amnestifying the extent of his wage arrears.